ftrack would not be much without users and that is why we offer a few different ways to manage the user accounts. The user management page is found at System settings ‣ Resources ‣ Users and Groups. Each of the ways differ when it comes to where the user credentials are stored. However, regardless of option, all users must have an account in ftrack to be able to sign in (even if the account only contains information such as username and what type of account it is). You will be logged out immediately if you remove the user you are currently logged in as. Once you have your users in the system, you can also assign them permissions and roles to govern who can see and do what. Custom attributes can be added to user objects and can be used as any other attribute, like a custom attribute in the tasks spreadsheet. A custom attribute can be added at the System settings ‣ Advanced ‣ Custom attributes page. 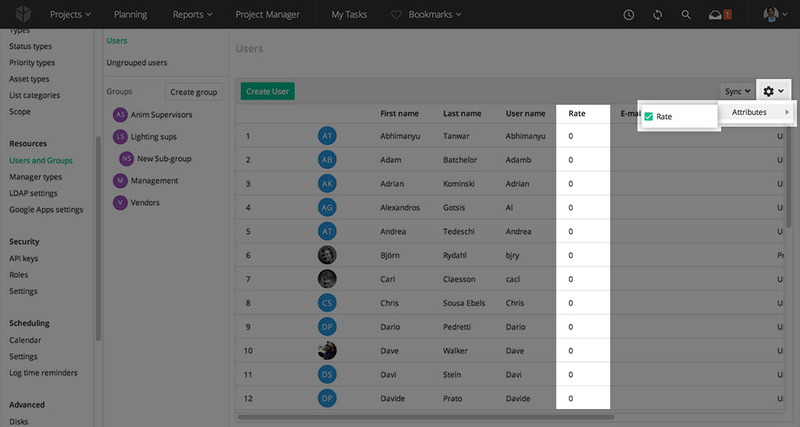 Be sure to select User in the Add to box when creating an attribute to make it show up in the toolbar on the Users and Groups page. The Attributes menu in the spreadsheet is only available when you have custom user attributes created in ftrack.